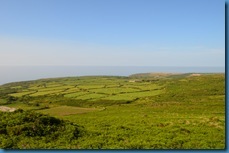 Good morning from a slowly brightening southern Cornwall. The early cloud is disappearing and it looks like being another fabulous day. We’ve had a great weekend in the company of our friends Kevin & Lawrence, visited some great places and enjoyed the continuing good weather. Oh, and won a certain cricket match too. Excellent. The hay fever has improved too – as well as upping the dosage on the antihistamines, Trev came up with an idea which he had heard somewhere – that of sticking vaseline up yer hooter, halting the progress of the offending pollen in it’s tracks. I’ve got to tell you it works a treat too and such a relief. Right, we were we? Ah yes, it’s all coming back slowly – I really should make notes. Wednesday and after getting the blog out we had a late late breakfast following a visit to one of the local shops down in Sennen. The locally produced bacon, sausages & eggs all tasted far better than the supermarket that reckons ‘every little helps’ could offer. If you are down here – pay them a visit. Service with a smile, local products and you wont get ripped off either. The rest of the afternoon was spent listening to the opening exchanges in the cricket. Although we now know the result, it was very hard to tell at the time, which way it was going to go. 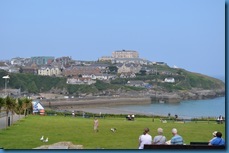 Back on the tourist trail on Thursday with a visit to Newquay on the north coast in our furthest excursion to date. 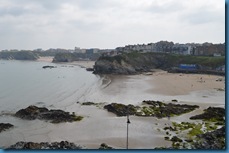 Newquay is popular with the surfing fraternity and has some pretty bays and beaches as well as lively nightlife which has attracted some adverse publicity of late. 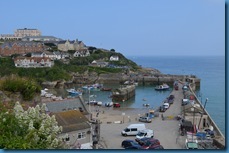 There is a pretty little harbour and the town is pleasant enough, with all the usual outlets you would expect, but with a prevailing whiff of freshly baked cornish pasties everywhere. Given that it was nearly lunchtime, it took a lot of willpower – more than at any time since I gave up smoking – to resist, such was the drool inducing smell! 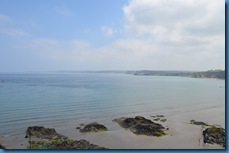 We eventually succumbed – not to pasties, or in Newquay – but along the coast a little at Perranporth. 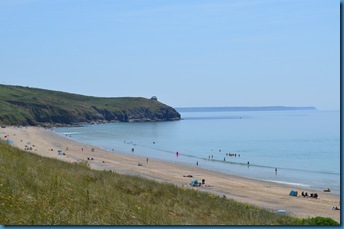 A small resort with beautiful golden sands and much more family orientated. 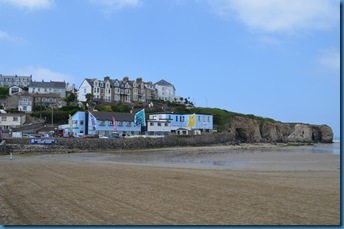 Having completed the lens clicking we called in at the Cool Beans Cafe along the main drag, mainly because there was seating outside, but we certainly chose right because the food – a bacon baguette for Trev and a breakfast panini for me – was delicious. 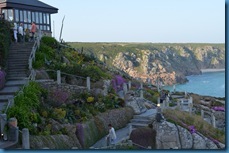 Further down the coast was St Agnes and we called in there very briefly to have a look but with parking tricky and time marching on we turned tail, but vowed to return one evening for some grub and grog. Friday and another warm one. 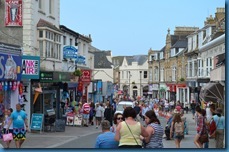 First stop was Penzance to procure some pasties for the evenings meal. 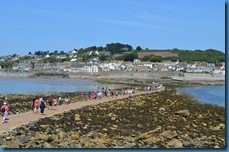 Funnily enough buying fresh cold pasties proved a little harder than we imagined but it did give us the chance to see a bit more of Penzance and very pretty it was too – looking far better in the sunshine than on our previous visit. Then it was off to the supermarket to stock again – possibly the least satisfying activity of any caravan holiday, barring perhaps the journey home. 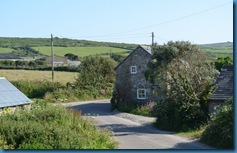 Our friends arrived on Friday afternoon having booked in to one of the static caravans for the weekend. The aforementioned pasties (now hot) were served with Cornish new potatoes and veg and a glass of vino before we headed out for the evenings entertainment. 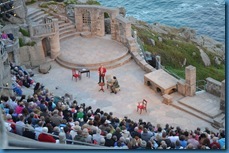 Just down on the south coast lies the Minack open air theatre – and it is right on the coast. 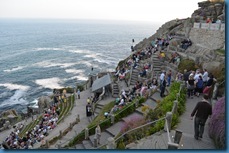 The seating areas are carved out of the crags and look down to the stage area below which is near – but a reasonably safe height & distance – from the waters edge. The theatre was the 1930’s dream of one woman – a local called Rowena Cade who continued to oversee until her death in 1983 and it is truly stunning. What’s on really doesn’t matter that much – it’s the setting that does it. However, for the record we saw A Woman of no Importance – Oscar Wildes amusing attack on Victorian double standards. 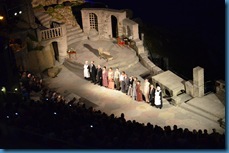 Of more interest to us was that it was the Brighton Little Theatre company that put the show on. It was amusing and seemed well received with some great lines still relevant today but it’s really all about the location. A must if you are down this way – but book up early. 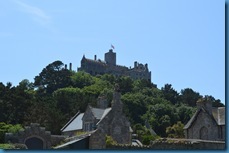 Saturday and whilst Lawrence went off to help his sister move house, the three of us headed back up the A30, in the general direction of Redruth, but stopping first at Camborne. The promise of an even hotter day had forced yet another concession to the weather with my shorts coming out although they were of course, black. Anyway, Parking was free thanks to a very kind lady who gave us her ticket and coffee, procured from a little cafe in the high street was both tasty and reasonably priced too. There was nothing obviously touristy to do – I hadn’t read up on the place beforehand, but we found ourselves in a junk shop at the far end, piled high with old stereos, speakers and so on. Kevin, who always has an eye for a bargain, or better still a freebie, spotted a coiled up rope light in the corner. Thinking that it would look good around the awning we asked how much it was. The chap plugged it in to test it and noting that not one single bulb lit up said we could have it for nowt. Confident that I could get it going somehow, we thanked him and walked out with it. 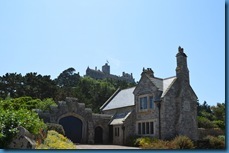 We had no time to see Redruth as it was time to head over to Porthowan to meet Lawrence and his sister & brother-in-law for lunch. 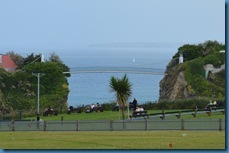 We were early and took the opportunity to walk up the cliffs at the side to get a better view of the beach. 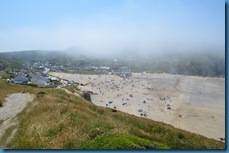 As we ascended however a sea mist rolled in enveloping the whole beach! I still got some photo’s but they aren’t as good as I hoped. Lunch was taken at a beach bar before we headed back to the site to drop off one of the cars before heading over to the small town of St Just just a few miles from the camp site. 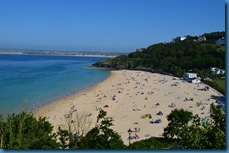 Norman – the boss – had suggested the bus ride from St Just along to St Ives further up as a good way to pass an afternoon. And it certainly was. 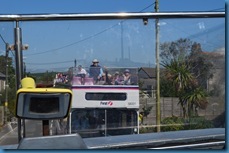 Some great views from the open top deck but challenging for the driver as the bus wound it’s way along some VERY narrow country lanes and he had to reverse more than once. 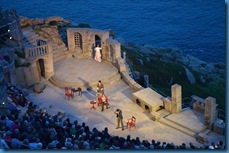 It was getting late so we didn’t hang around in St Ives, but pencilled it in for a a visit later in the week. Back at the site, the bbq was pressed in to service again and after a little tinkering and literally cutting out the control unit, the aforementioned rope light sparked in to life too. Sunday and another hot day – well relatively. My Aussie friends reading this must be wondering what all the fuss is about. Anyway, first stop was back to Lizard point. The boys had never been and we we happy to go back and show them – and it was just as enjoyable as before, although already getting busy. 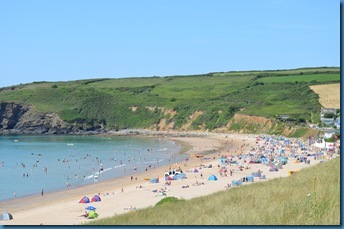 Next up was Praa Sands. 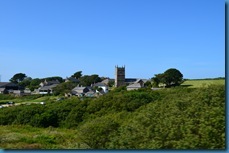 It was just off the main road on the way back from the Lizard and we’d past it a number of times on our ways back and forth. 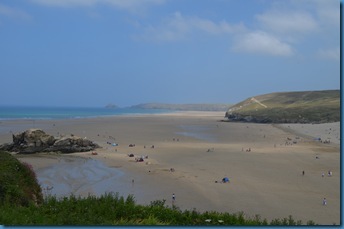 A beautiful expanse of sand and shallow water, great for families with young kids and a beachside cafe which was the focus of our attention. We paused for cream teas before trudging back up to the car park. 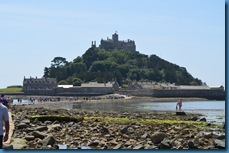 Marazion was next, a a pleasant enough place in it’s own right but more popular as the gateway to St Michael’s Mount. 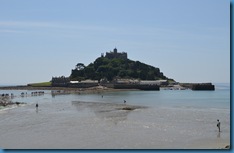 An island with a fairytale like castle perched high above and all accessible by foot only at low tide along a stone causeway or by boat. It was a warm day – AND the weekend – AND the local carnival was on, so not surprisingly we weren’t the only ones here making parking a little more tricky. It was worth it though, the walk along the causeway was lovely (it was pure luck that we’d arrived at low tide by the way!) 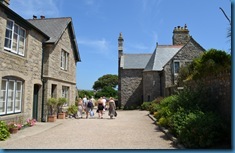 and ambling around the little village once on the island was lovely. We didn’t go in to the castle itself – that’s extra – unless you are a National Trust member that is – but thoroughly enjoyed it nonetheless. With vague notions of Sunday lunch on our minds we drove back to St Just in the hope of grabbing something to eat at one of the pubs but they had all stopped serving by the time we got there. However, one ‘em said we could bring our own food so, after a foray in to the local co-op we returned and enjoyed a sandwich and a couple of pints, which went down very well indeed. 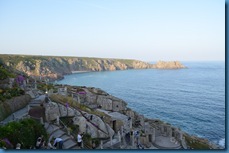 We returned in the evening for a proper meal – although this time at a different hostelry, before heading down to Sennen Cove again in the hope of seeing another glorious sunset. 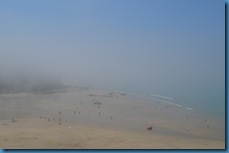 Ironically though, because of said sun and it’s recent and almost continuous (and very welcome) appearance the sea had warmed up and produced a thick sea mist almost entirely enveloping the cove, so we were out of luck. So, just about up to date again. Just read this back and it’s about as amusing as a party political broadcast, so apologies for that. Hopefully the photos will make up for it.The boys have left for their long journey back to Brighton. It’s warming up and feels like it’s going to be another scorcher – although it might be dark by the time I’ve finished with this – and sightseeing duties resume tomorrow. Having had words with both solicitor and estate agent late last week it now looks like we might be exchanging contracts very soon which will be a welcome relief, but I’m not holding my breath!